One of the UK’s most recently launched craft beer producers is the Magic Spells Brewery from Leyton in East London. Here, a tasting panel tries out the brewer’s three launch beers – Craft Lager, Hackney Hare Pale Ale and India Pale Ale – all three bottle-conditioned beers and each with its own style. One of the latest craft beer breweries to spring up in the UK is the Magic Spells Brewery in the Leyton area of London. Though new as a commercial brewery, its origins stretch back three years to Epping in Essex where founder Jas Hare started brewing beer for friends’ parties and a mate’s band. The same half-barrel brewing kit is still used at the new site in east London but it has been joined by a ten-barrel kit to help it meet market demand for its three bottle-conditioned beers. Bottle conditioned means the beer is still live in the bottle, that is it contains yeast and is still fermenting as it sits in the bottle in the cellar or kitchen. 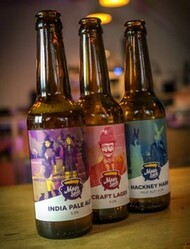 The three beers are Craft Lager, Hackney Hare Pale Ale and India Pale Ale. The company describes them as a gateway between modern craft beer and brewing techniques and old styles and methods, taking inspiration from classics and adding a modern twist. The brewery sources most of the malt used in its beers from the UK plus British hops boosted by punchy flavoured hops from New Zealand and America. I was one of a three-person tasting panel that put the beers to the test in May 2017. First, congratulations to the brewery for going down the traditional bottle-conditioned route rather than following what a number of craft brewers are doing now and opting to sell their beer in cans. While I know can technology has come on in recent years and can preserve the flavours of the beer without adding a tinny taste, when it comes to any quality food and drink, presentation is part of the equation, and it is so much better to see the beer in a good solid bottle than what looks like a cheap and nasty tin, no matter how well decorated. : The first beer we tried was the Craft Lager. The official tasting notes says this has an aroma of tangerine and light passion fruit, and tastes clean, fresh and light with a light bitterness and dry finish with gentle hints of melon. The beer uses Perle, Saaz and Tettnang hops. The panel commented on its notable hoppiness and floral smell. It was clean tasting without citrusy – also know as wuzzy – flavours. The bitterness was pleasant and it was not over gassy. And it had a long bitter finish. : We then went onto the Hackney Hare Pale Ale. This is described as having an aroma of light citrus, with hints of lime and gentle floral tones from the hops. On taste, it is said to have orange and red grapefruit citrus initially, with passion fruit and lychee in the middle, followed by a slight resinous back tone. The notes says it is dryish, with a robust but not overpowering bitterness throughout and a long finish. The beer uses Cascade, Columbus and Motueka hops. The panel’s verdict was that it had a noticeable yeasty taste and citrusy smell, but the flavour was of a more natural rather than wuzzy bitterness. It was strongly hopped but not over hopped, however it lacked in balancing flavours to the hops. : The final beer we looked at was the India Pale Ale. This is said in the tasting notes to have an aroma of blood orange, light pepper and subtle blackcurrant. The taste is said to start with punchy pink grapefruit and sherbet with slight hints of caramel from the malt and a very subtle liquorice back note. The body is said to be medium with light sweetness, well balanced, medium lasting and not overpowering bitterness. The hops used are Chinook, Columbus and Mosaic. Here, the panel disagreed with the tasting notes. We thought it was over hopped and had a strong grapefruit flavour that dominated. We couldn’t detect the subtle blackcurrant at all, though it did have a light pepperiness on the back of the throat. The citrusy aroma had an underlying strange smell that we couldn’t identify. Given all three of us are traditional ale drinkers, we rather surprisingly all voted for the Craft Lager as the best of the three. The Hackney Hare Pale Ale was pleasant and well drinkable. Our least favourite was the India Pale Ale, which while OK in small doses was probably too hoppy to drink in larger quantities. Magic Spells Beers are available in both 330ml and 500ml bottles with a retail price of around £2.50 and £3, respectively. All three are available via online retailer Alesbymail.co.uk and will be sold in bars, pubs and restaurants: they are already available in some eateries, bars and retailers in London’s East End. The brewery has its own taproom bar and bottle shop that serves the beers on tap, cask and bottle. It also sells spirits, wines and ciders, and guest beers from other craft breweries. Its address is 24 Rigg Approach, Leyton E10 7QN. Further beers are planned in the coming months including special collaborations and guest beers. The latest gluten-free product to hit the market is an Indian beer called Goa Premium Beer, but is it any good?